ww2dbaseJean-François Darlan was born in Nérac in Lot-et-Garonne. He graduated from the École Navale in 1902, and commanded a naval artillery battery during WW1. He became a rear admiral in 1929 and became chief of staff in 1936. In 1939 he was promoted to the rank of admiral of the fleet and given command of the entire French navy. ww2dbaseWhen Paris fell in Jun 1940, Darlan expressed his support for Premier Philippe Pétain's armistice with Germany. 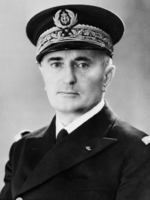 He served in Pétain's Vichy government as the Minister of the Navy. In 1941 he briefly held several political posts. Despite his loyalty for Pétain, the head of state that in actuality answered to Berlin in many respects, Darlan refused to turn the French navy under German control. On 7 Nov 1942 he visited his sick son in Algiers, and met with Allied representatives the next day. Forces under Darlan's command fought the Allied attempts to secure a footing in North Africa until 10 Nov when Darlan officially ordered for a cease fire. He had second thoughts about his order, especially after facing a dismissal by Pétain, but a meeting with American General Dwight Eisenhower and receiving the news of German troops marching into Vichy France (violating the French-German treaty of 1940) fully made up his mind. Eisenhower maintained Darlan as the High Commissioner of French North Africa. He ordered for the scuttle of the French fleet at Toulon to prevent them from being used to aid the Germans. ww2dbaseOn 24 Dec 1942, Darlan was assassinated by the 20-year-old Ferdinand Bonnier de La Chapelle. He died from the gunshot wounds several hours later. The assassin was executed two days later. He was succeeded by General Henri Giraud. ww2dbaseSources: Crusade in Europe, Wikipedia. 7 Aug 1881 François Darlan was born. 1 Jan 1937 François Darlan was made the chief of staff of the French Navy. 12 Jun 1940 French Admiral François Darlan, Commander-in-Chief of the French Navy, assured British Prime Minister Winston Churchill that there would be no question of surrendering the French naval ships. He further asserted that orders would be given to scuttle the ships if such a danger were to exist. 16 Jun 1940 François Darlan was named the Vichy French Minister of the Navy. 9 Feb 1941 Admiral Darlan became the new Vice Premier of Vichy France. 15 May 1941 Admiral Darlan returned from meeting with Hitler and Ribbentrop; Vichy-French cabinet approved German concessions as well as French counter-concessions. 12 Aug 1941 French Marshal Philippe Pétain appointed Admiral François Darlan as Minister for War, the Navy, the Air and the Colonies. General Maxime Weygand was thus placed under Darlan's orders. 18 Apr 1942 François Darlan stepped down as the Vichy French Vice Premier as well as the Minister of the Navy. 24 Dec 1942 French Admiral François Darlan was assassinated in Algiers, French Algeria by monarchist Fernand Bonnier de La Chapelle.